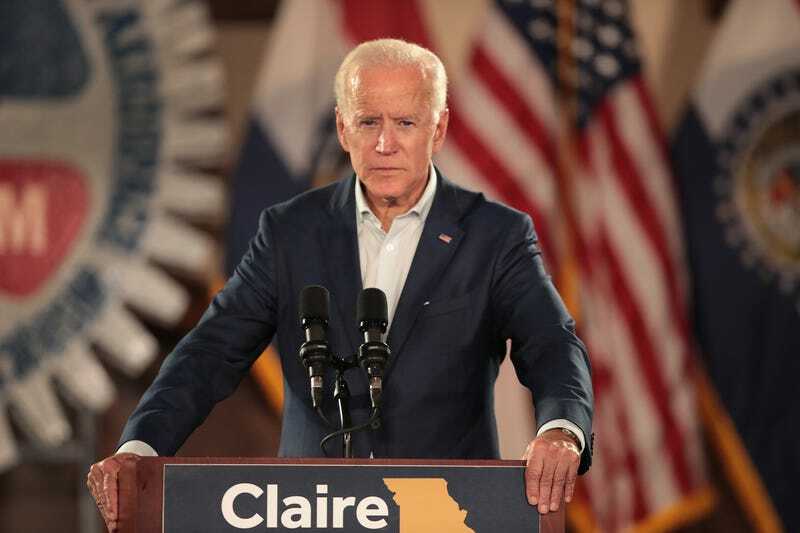 Former Vice President Joe Biden speaks to supporters of Senator Claire McCaskill at a ‘get out the vote’ rally on October 31, 2018 in Bridgeton, Missouri. A Connecticut woman has come forward to accuse Joe Biden of touching her inappropriately and rubbing noses with her at a 2009 political fundraiser, making her the second woman to accuse the former Vice President of unwanted physical contact as he deliberates whether to join a crowded 2020 Democratic presidential race. Lappos’ allegation came three days after former Nevada State lawmaker Lucy Flores accused Biden of an “awkward and disturbing kiss” at a campaign rally in 2014. According to ABC News, while Biden campaigned for her when she was running for lieutenant governor, he allegedly leaned in from behind, smelled her hair and gave her a “slow kiss” on the back of her head. On Tuesday, in an effort to preserve his character, his office provided a lengthy list of 24 testimonies from an assortment of notable women detailing their positive interactions with the former vice president. Per The Hill, this list includes The View co-host Meghan McCain, #MeToo activist and actress Alyssa Milano, and MSNBC host Mika Brzezinski. Other supporters of Biden have taken to social media to share their own experiences. It’s not exactly a secret that Biden has a propensity for hugging or physical touching those he interacts with, but his behavior has come under increased scrutiny as awareness surrounding sexual assault and harassment is at a all-time high. Both Flores and Lappos claimed they did not speak out about Biden’s alleged behavior out of fear of being dismissed.